Duke vs. UNC is one of the most well known rivalries. 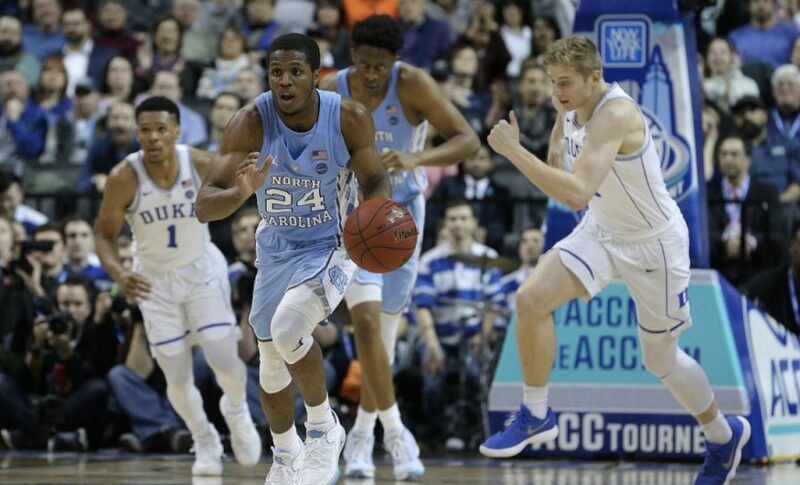 With the National Collegiate Athletic Association (NCAA) tournament just around the corner, fans are preparing themselves for some of the biggest games and rivalries in college sports. Notable rivalries in college basketball include Louisville vs. Kentucky, Kansas vs. Kansas State, Michigan vs. Michigan State and of course, Duke vs. UNC. Although games like these may have the biggest stars and the most electric crowds, there are other, lesser known rivalries from smaller conferences that are still fiercely competitive. Akron, Ohio is a basketball city, having produced one of the best players in NBA history: Lebron James. But northeast Ohio also has a lively college basketball community as well, and the University of Akron’s rivalry with Kent State has transcended decades. Both schools play in the Mid-American Conference East, and are located just 15 miles apart. In 2011, Akron beat their local rivals in overtime to secure a spot in that year’s NCAA tournament, but a post-game skirmish followed suit. Kent State guard Michael Peroni was accidentally stepped on by their celebrating opponents, and security had to interfere to calm the flairing tensions. Akron defeated the Kent State Golden Flashes 72-53 in their first meeting this season, but Kent State got their revenge last Friday, winning 68-65 over their rivals. Another overlooked basketball rivalry is the battle between Ivy League schools Penn and Princeton. The Quakers and Tigers have played one another 239 times since their first meeting in 1903, with Penn holding a narrow lead over their rivals. Historically, these are the two most dominant forces in Ivy League basketball, with the title being won or shared by both teams in 44 of the 45 seasons between 1963 and 2007. Princeton’s 8-6 conference record, however, which includes two wins against Penn, could be enough to see them qualify for the tournament again. Gonzaga has dominated college basketball in the West Coast Conference (WCC) for close to two decades but often find themselves having to fight off their pesky rivals Saint Mary’s. Gonzaga, unsurprisingly, lead the conference right now with the Saint Mary’s Gaels a few games behind in second place. However, the Gaels should be used to this shortcoming, as they have finished second to Gonzaga five times between 2004 and 2009. Because of this history, the two Catholic universities have a big brother-little brother relationship, with Gonzaga playing the role of big brother. Do not get confused though, as there is no brotherly love between the schools – the Gaels and Bulldogs will do anything they can to beat the other. Gonzaga dominated the Gaels in both of their regular season meetings this year, winning 94-46 and 69-55 respectively. However, in this season’s WCC Championship game, Saint Mary’s upset five time reigning tournament champions Gonzaga in a 60-47 win. Women’s college basketball is a sport on the rise, with 2017’s final four games drawing an average viewership of over 3.8 million people. Connecticut (UConn) women won the tournament four times between 2013 and 2016, currently giving them the most titles of any division one team with 11. However, just below them are Tennessee, with eight national titles, the most recent coming in 2008. The Vols and Huskies have met in the NCAA tournament a whopping seven times in 12 years starting in 1995. Four of those came in the national championship game, all of which were won by UConn. Unfortunately, however, it is unlikely that we will see another matchup between these two great programs, as Tennessee currently sits at 7-9 in the Southeastern Conference. March Madness is upon us, and with that comes a history of rivalries and feuds. However, not every great matchup can get prime time TV coverage on ESPN. For every Duke-UNC game, there are dozens of other great, lesser known rivalries across the college basketball spectrum.